Since the advent of flight more than a century ago, aircraft production for airplanes and helicopters has evolved from its most primitive form to the current production, where roughly half the final product is created with plastics. The injection molding equipment at Superior Plastics has the ability to produce the necessary items that go into the production of these forms of aircraft. The many values of using plastics in aerospace are that they can be fabricated economically and with a greater degree of freedom. Unlike metals, they’re also resistant to corrosion, while serving as a lighter option than aluminum. Finally, that lightweight approach results in energy saved, which translates into extra money for a company. Polychlorotrifluoroethylene (PCTFE): This enduring plastic has the flexibility to withstand both brutal cold and tremendous heat, since the corrosive effects of any damage is virtually non-existent. The range spans 800 degrees, from 400 degrees Fahrenheit to 400 below. It also is able to withstand both fire and chemicals, and limit any water damage to an absolute minimum. Polyamide-imide (PAI): Known commercially as Torlon, this has the capability to serve as a flame retardant and is able to maintain its strength at temperatures that may reach as high as 500 degrees Fahrenheit. One other asset is that when it burns, no smoke results from it. That can be especially important when the potential for smoke inhalation may exist or any dangerous chemicals may be unleashed into the surrounding airspace. Polytetrafluoroethylene (PTFE): This is undoubtedly the most familiar of all the plastics used, since it’s better known as Teflon. The many cables and wires that serve as integral aspects of airplanes or helicopters connect all different facets together, but insulating them is paramount to keep them in working condition. That’s where PTFE comes in, since is mostly resistant to tears and isn’t really flammable. Polyetheretherketone (PEEK): Another flexible plastic that’s prized by companies in this industry, since the temperature range it can work within is vast. While it can withstand temperatures of over 400 Fahrenheit, its greatest value may be in its ability to thrive in sub-zero conditions or inclement weather. Areas like the pump gears or valve seats are popular areas to use this product. Thermosetting Polyimide: Better known as Meldin 7001, its value is derived from the combination of flexibility and reduced weight. Coupled with the ability to also offer strong chemical resistance, this works best when components like the threaded nuts that effectively keep the plane together are properly insulated. In addition, having the wheels stay in their proper alignment is the job of the spacer, another vital area that can’t be afford to be overlooked. 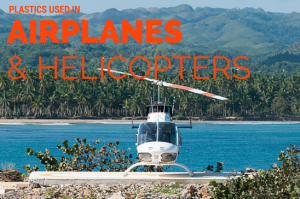 Aerospace companies that need a reliable company to create the necessary components for either airplanes or helicopters need only look as far as Superior Plastics. We have more than three decades of aerospace injection molding experience. Contact us online to get started.